Not PC: Q: What do Waitangi and Kohimarama have in common? 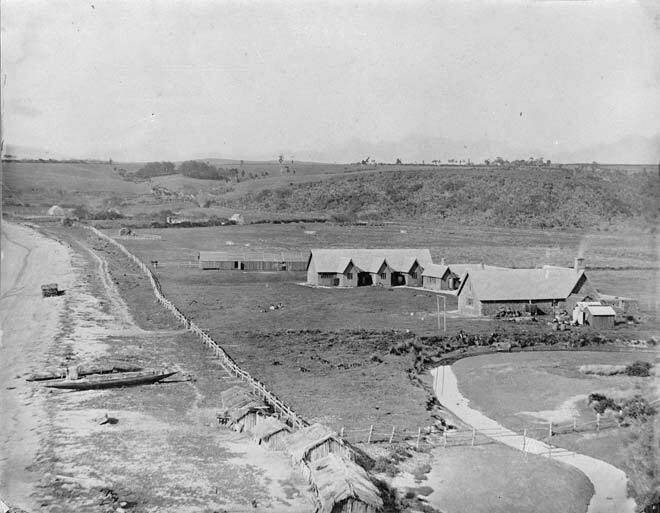 Kohimarama Beach in 1860. Cafes yet to open. ANDREW LITTLE’S FLAT FEET were found walking all over Waitaingi over the weekend, both ending up finally in his mouth. Maori never ceded sovereignty, he seemed both to say and not say to different audiences over different parts of the weekend. Not said by Little at any time then or since was any genuine attempt to justify said view. Let’s be honest, it’s a view based on confusion, and advanced out of political expediency. WHEN THE TREATY WAS signed, little idea of property or property rights existed at all in the shaky islands, so in translating the Treaty other words had to do service instead. Imperfectly, it has to be said. The word now known loosely as “treasures” – taonga – was related etymologically to the spear, mostly because that’s how treasures were acquired and then ether held, or lost. So this was treasure held by might, not right; hardly comparable to the concept it attempted to represent. But it was drawn into service nonetheless, treasures acquired by the spear now acquiring the protection of the Crown’s guns. The other word used to describe the concept of property was rangatiratanga, or ‘chieftainship.’ Since few tribal Maori even owned any treasures in anything with any sense of permanence, the chieftainship which a tribal leader exercised over his tribe’s treasures and members was brought into service imperfectly as a substitute. And confusion has lingered ever since, not least over what was ceded with tribe’s retaining their “rangatiranga.” Not that it need have. when Governor Gore-Brown convened a meeting with 112 tribal leaders, many of whom had earlier been signatories to the Treaty, and most of whom were now more than moderately-well versed in the language and concepts in which the Treaty was written and being talked about. Gore-Brown’s opening address expounded very simply upon the blessings of property rights Maori derived from the Treaty, explaining them as the “price” paid by ceding sovereignty. In return for these advantages the Chiefs who signed the Treaty of Waitangi ceded for themselves and their people to Her Majesty the Queen of England absolutely and without reservation all the rights and powers of Sovereignty which they collectively or individually possessed or might be supposed to exercise or possess. So the answer to the question of what Feb 6 1840 at Waitangi and 10 July 1860 at Kohi have in common is this: they both ended in recognising that in signing the Treaty tribal leaders were ceding sovereignty to the Crown. To disagree with them would be chutzpah. To suggest they didn’t know what they were doing would be paternalistic hubris. For Little to continue the fiction he’s fidgeting with would be an act only of political advantage in disregard of the chaos that would result from peddling a lie. Is that really who Little is? The facts shown above should be printed on the front page of all major newspapers for a month, and shown on all TV stations four times a day for a month. Being in the age of knowledge and information is all fine and dandy when you have the skills to discern what the information is correct and what is not. I would argue that a lot of the information today is nothing more than propaganda. You only have to listen to Maori activists to understand that their claim to have knowledge is suspect because their information is suspect.